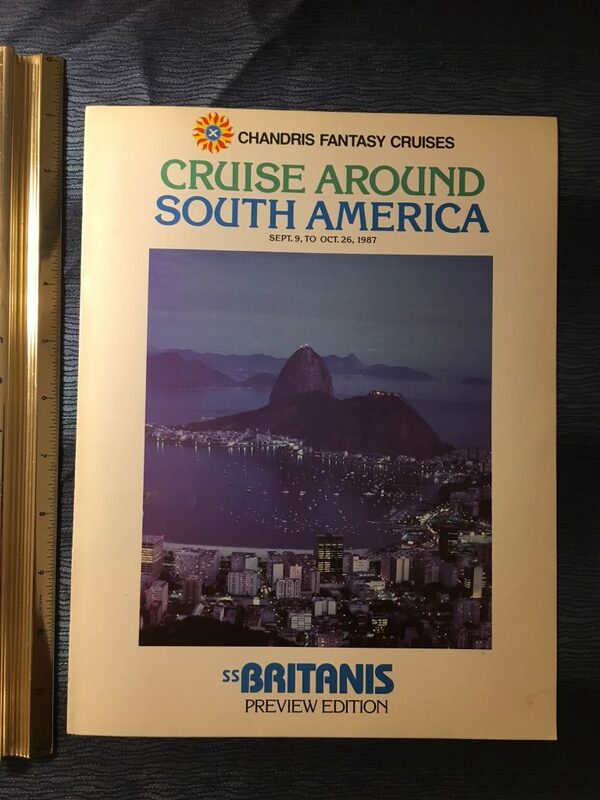 Sitmar: 1975 Cruises to Mexico, Alaska, Caribbean, SA and Panama Canal. After losing a mail contract for Australia, Sitmar was making huge inroads into the cruising market in 1975 with the recently converted Cunard Carmania and Sylvania. Excellent condition. 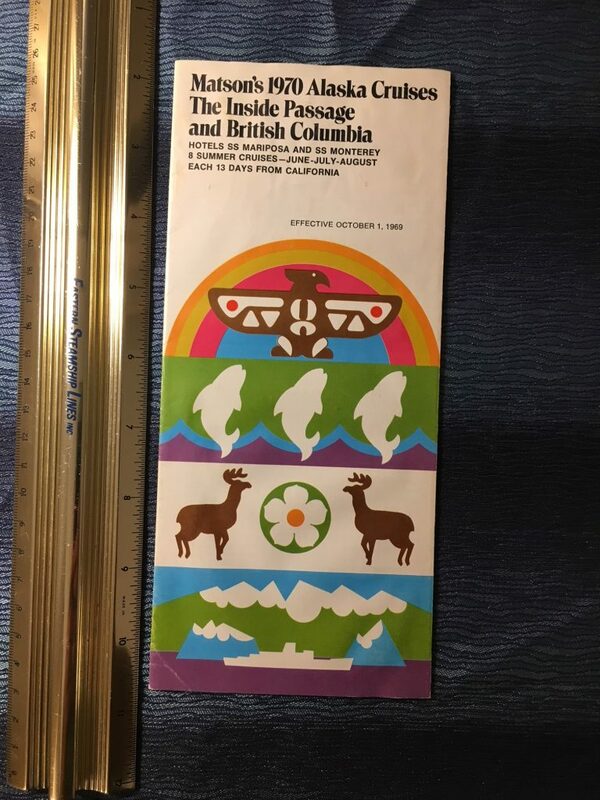 Great graphically superb used passage contract for a voyage in June of 1982. Nice foldout folder for the Mariposa and Monterey’s cruises around Alaska, British Columbia and the Inside Passage. 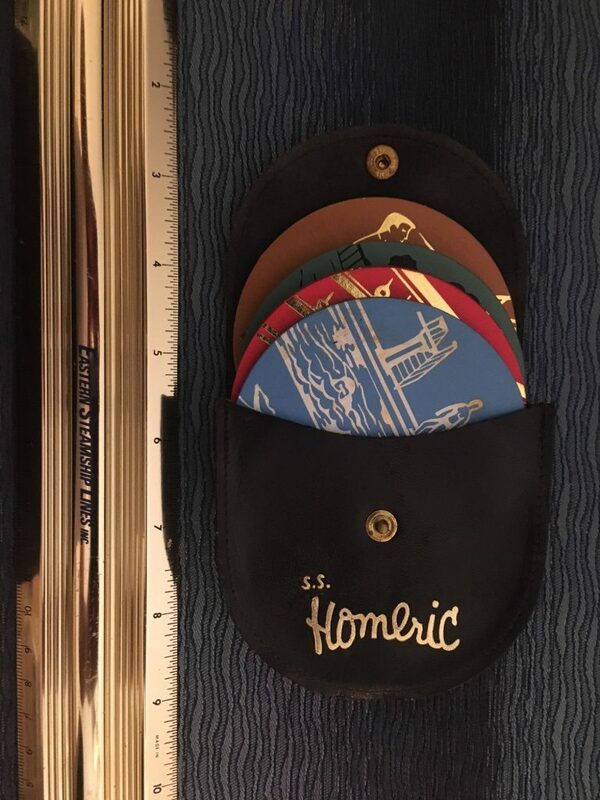 This nice little folder quickly covers 8 different cruises. Nice simple and colorful cover graphics. The item is a little wrinkled. 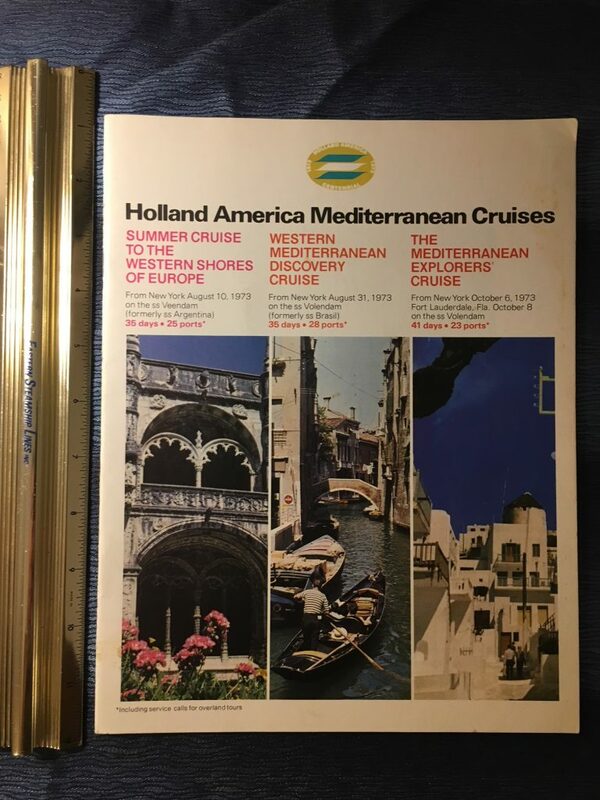 HAL: 3 Mediterranean Cruises 1973. The first HAL ship has set out to sea exactly 100 years ago in 1873 … and now the twin Volendam and Veendam (ex Brasil and Argentina) had joint the HAL fleet and been refurbished to a high cruise standard. These brochure adverts some of their earliest cruises and voyages. 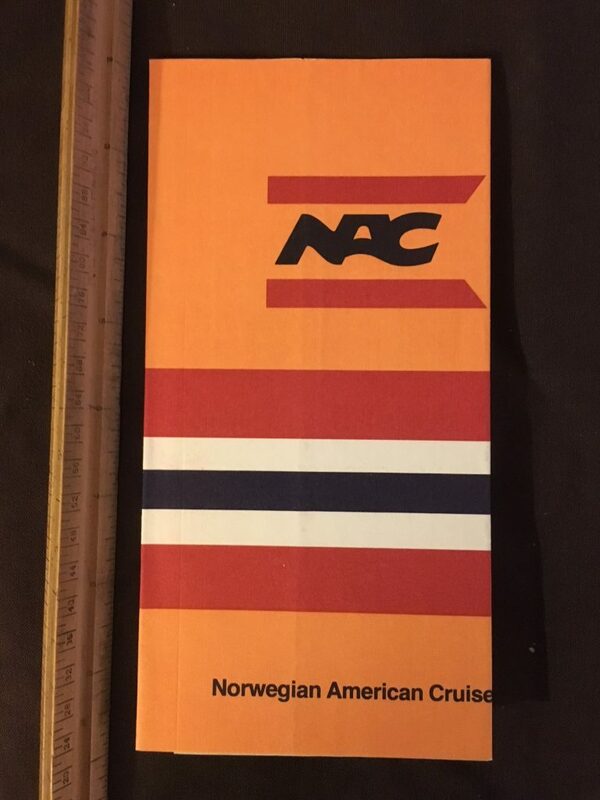 Heavy stock paper on the 23 pages that include photos, Route maps and deck plans. 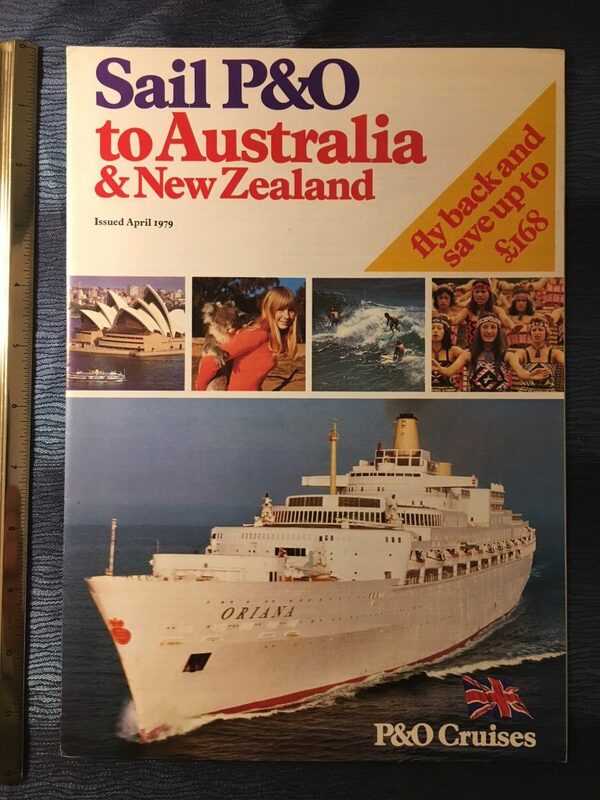 P&O: Sail to Australia and New Zeeland 1979. Nice large fold out for the 1979 cruise/voyages of the Oriana and Canberra. Large booking form is part of the foldout. 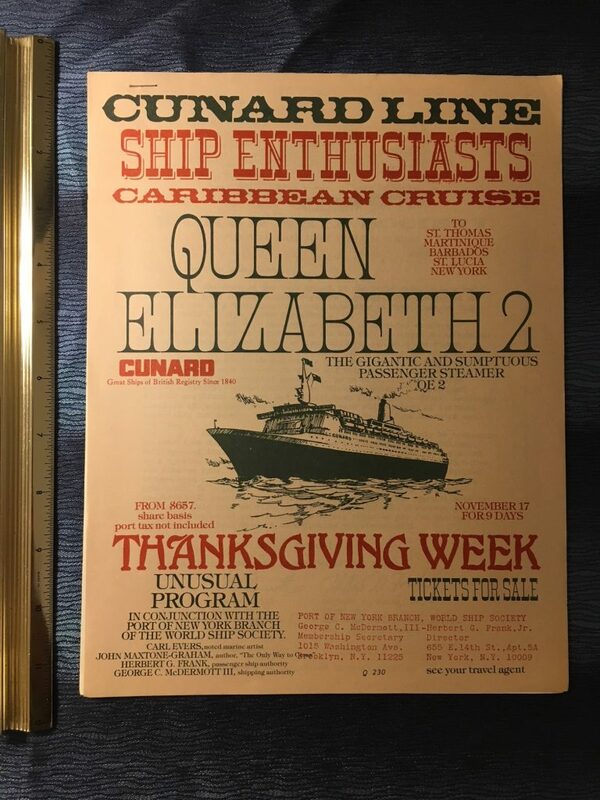 Interesting flyer and memo advertising the Ship enthusiasts cruise held in conjunction with e world cruise society over the Thanksgiving holiday in 1977. This 9day cruise left NY on November 17 for 9 days. John Maxtone Graham (ick) would have been a lecturer onboard and Carl Evers Maritime artist was also a guest. 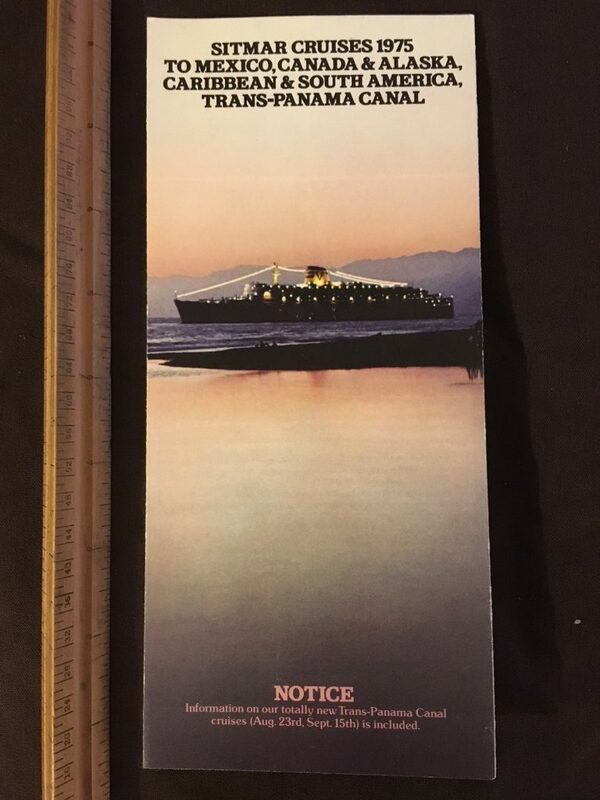 Great brochure for Strand Cruises and the Ithaca’s 1977 season back with Strand. 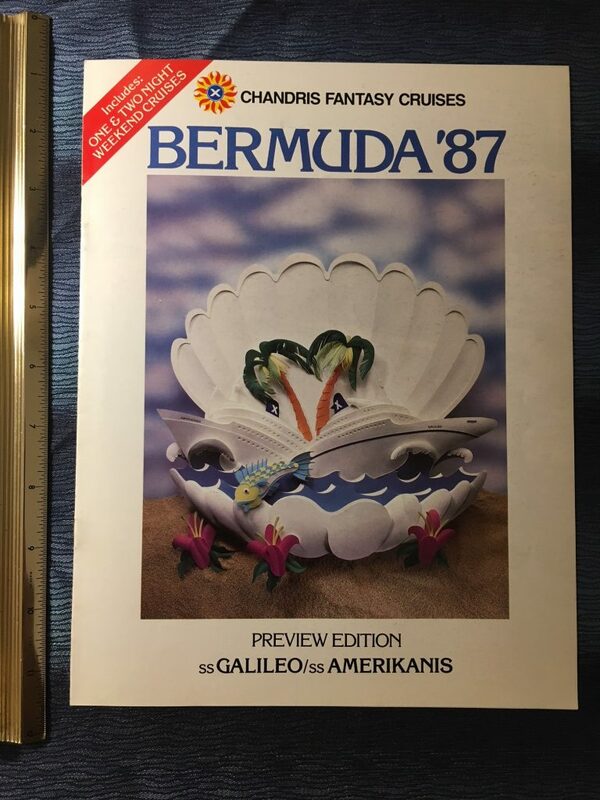 Nice graphics and a cool 2 page cruise map of the MED! 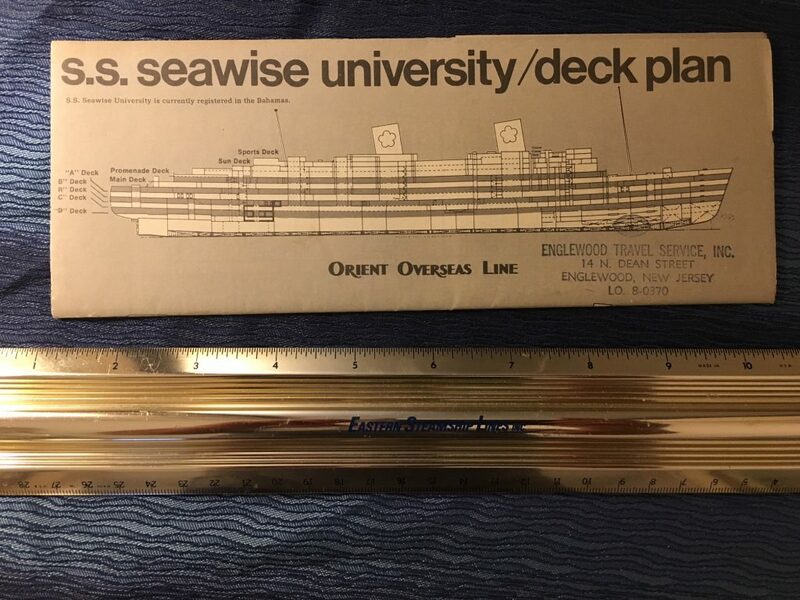 Orient Overseas: SS Seawise University Deck Plan. Nice DP for CY Tung’s unrealized dream to operate the ex Queen Elizabeth as a cruising university ship. Englewood NJ agency stamp. Double sides and crisp fold lines! Like new. 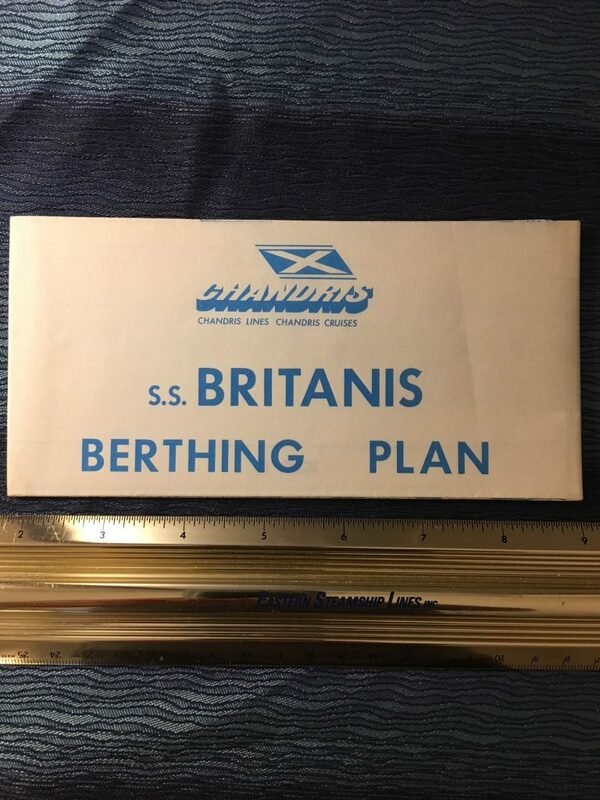 Nice blue version of the berthing plan for the lovely ship … Nice photo of the ship at sea of the ship on the back side of the folded deck plan. 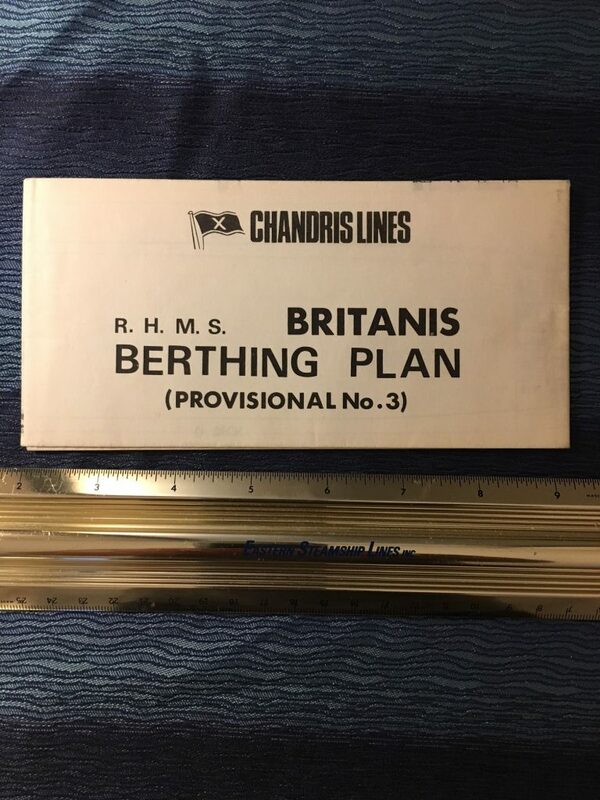 Nice B&W version of the berthing plan for the lovely ship .. Nice official portrait of the ship on the back side of the folded deck plan. 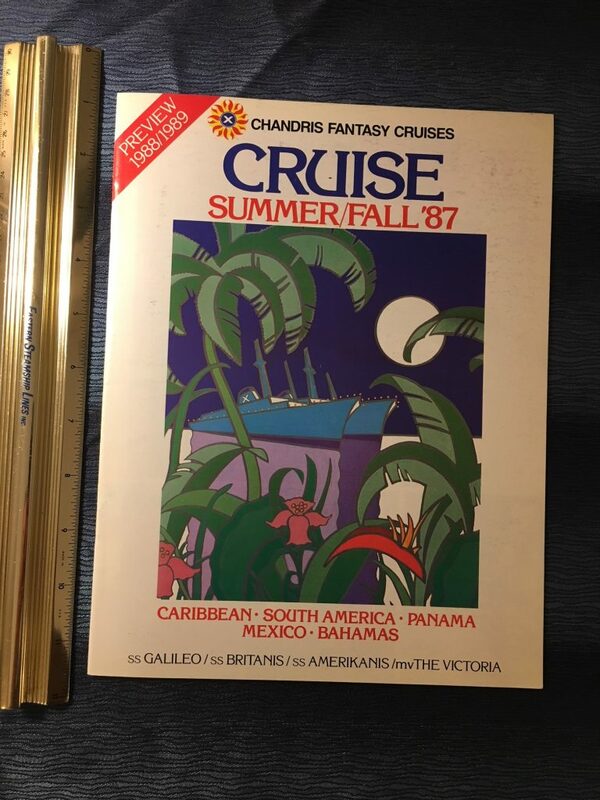 Preview brochure covering the cruise around South America cruise in 1987. Covers the ship and cruise with several photos. This is the abridged preview brochure. 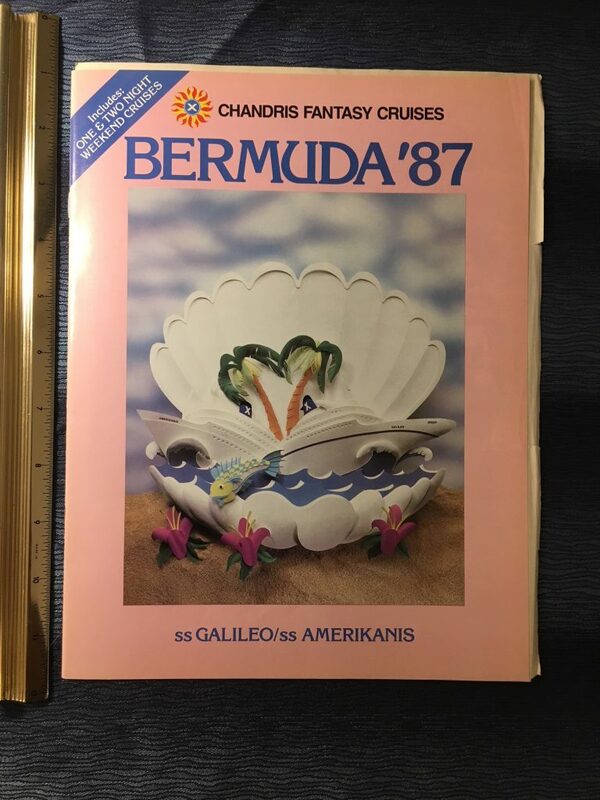 Like new pink brochure covering the 2 ship Bermuda cruises in 1988. Covers the ships with photos and deck plans and also covers other vessels in the fleet on the final page .. what variety as they say! 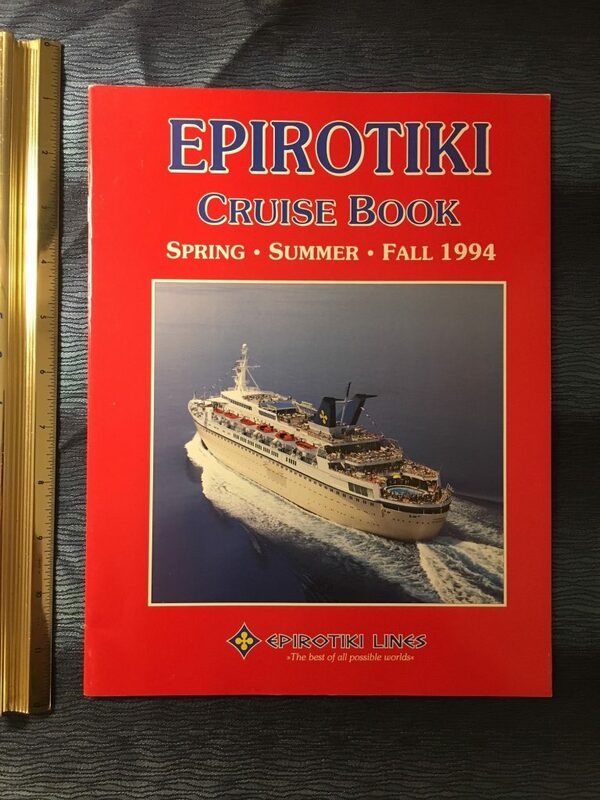 Super nice glossy and seemingly brand new for the Greek fleet dated in 1994. The first 2 sections are filled with onboard and destination photos, the 3rd section of the book is dedicated to the ships. My favorite fleet mate would be the Pallas Athena … formerly the French Flandre. She actually looks really good in her Portside profile photo. Other vessels like the Triton, World renaissance, Odyesseus, Jason, Olympic and smaller vessels are covered too! Excellent condition and resource! 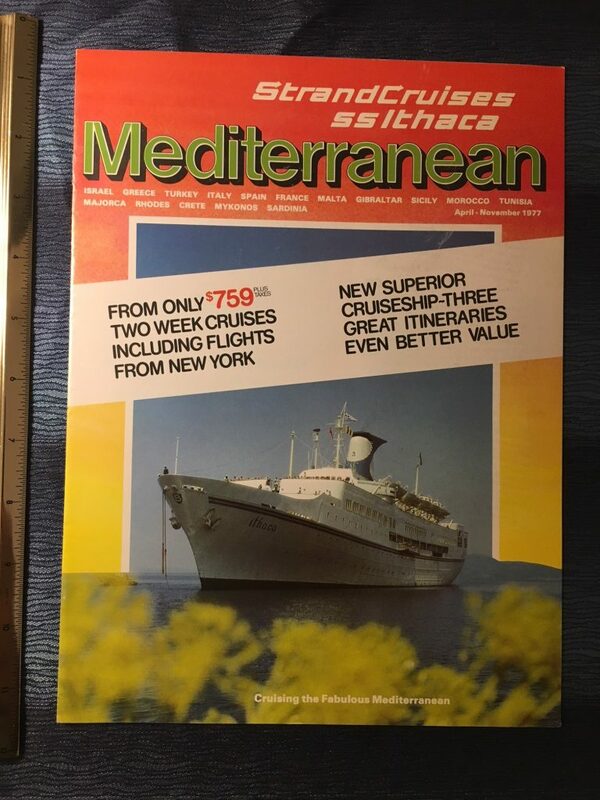 Sovereign Holidays: 1976 Air/ Sea Cruises Ithaca and Calypso. 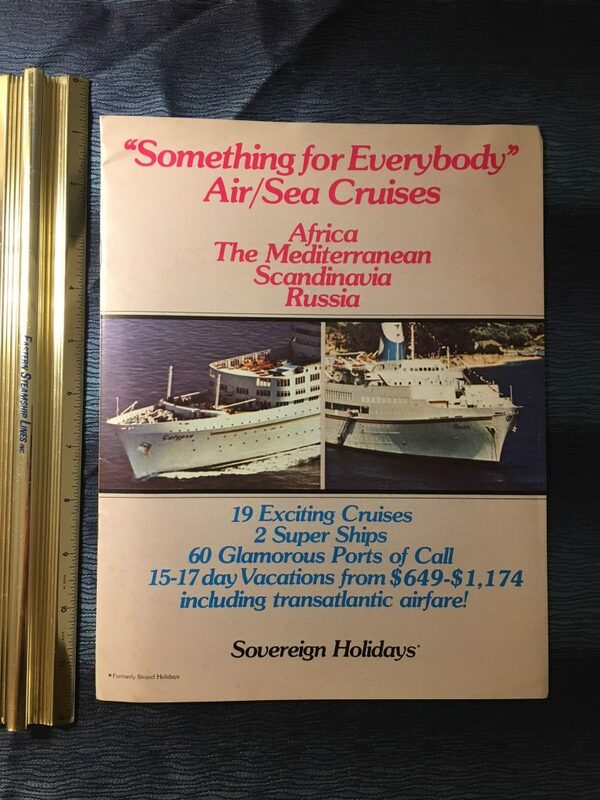 Great interesting brochure for these sets of 1976 cruises put on by Sovereign Holidays (formerly Strand Holidays). The 2 charted vessels had Greek registry .. the Ithaca catered to the Med, Africa and Russia … the Calypso covered the northern routes form the North Capes to North Africa. A bit unusual … both ships began with and went on to other services. 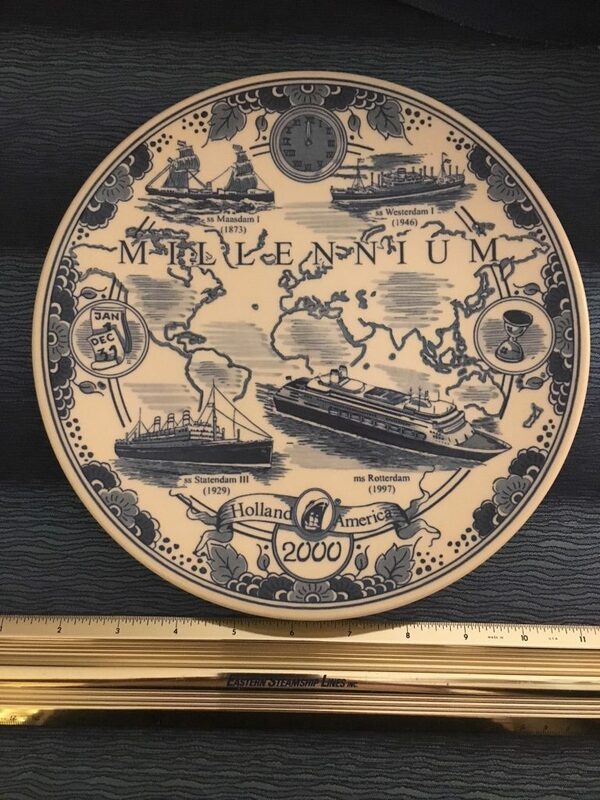 Excellent Blue Delft plate for the 2000 millennium celebration! Covers 4 vessels from the 1873 Maasdam to the 1997 Rotterdam . Super condition and has a wire on the back for hanging. 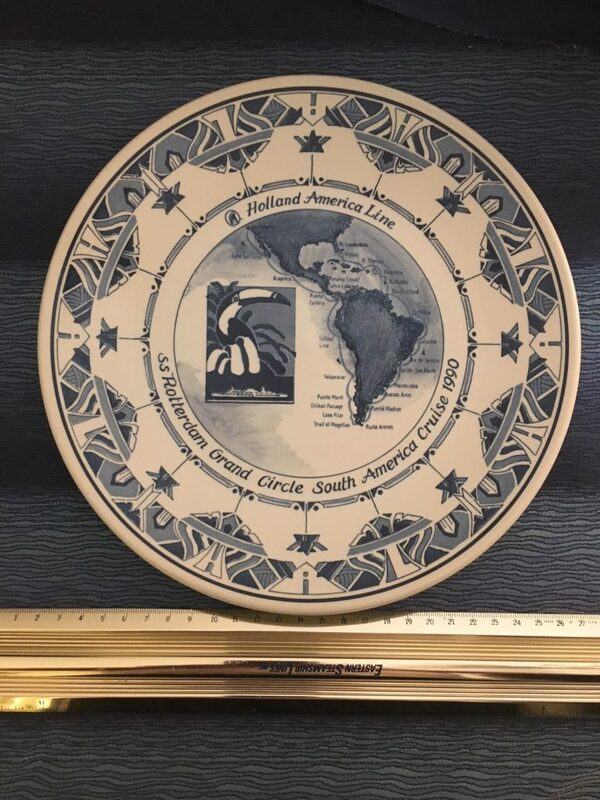 Excellent condition 1990 Grand Circle South America Cruise plate for the lovely Rotterdam of 1959. This is wired on the back to easily hang on your wall. 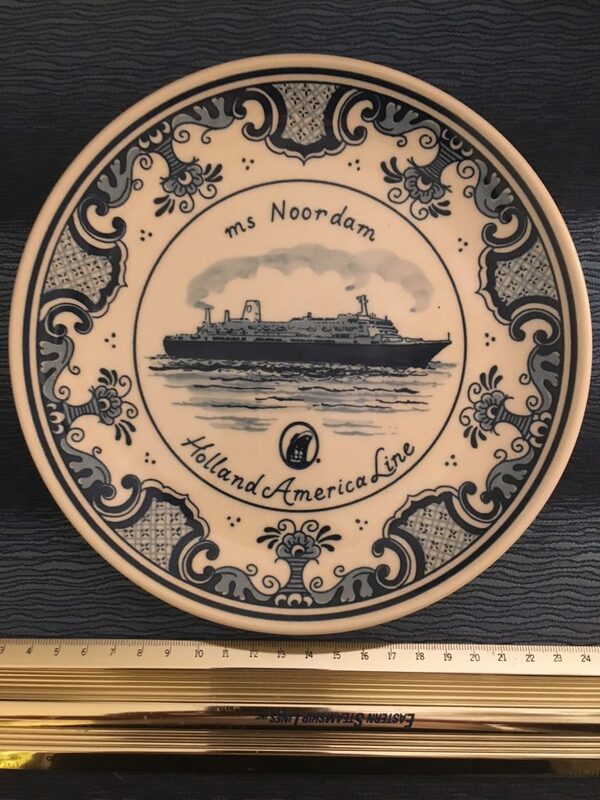 Excellent like new Noordam souvenir plate … certainly bought onboard! 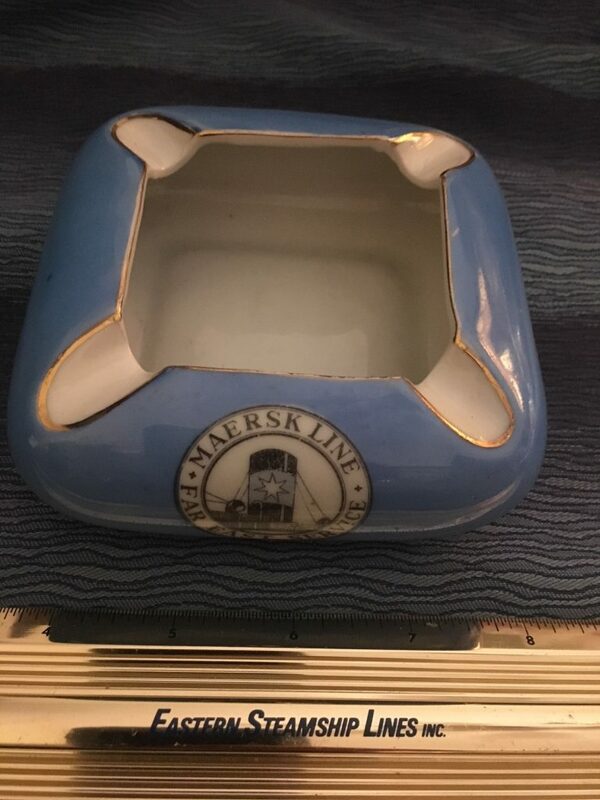 Super nice china ashtray for the Maersk line. Lovely blue color with a great gold trim … In excellent condition! 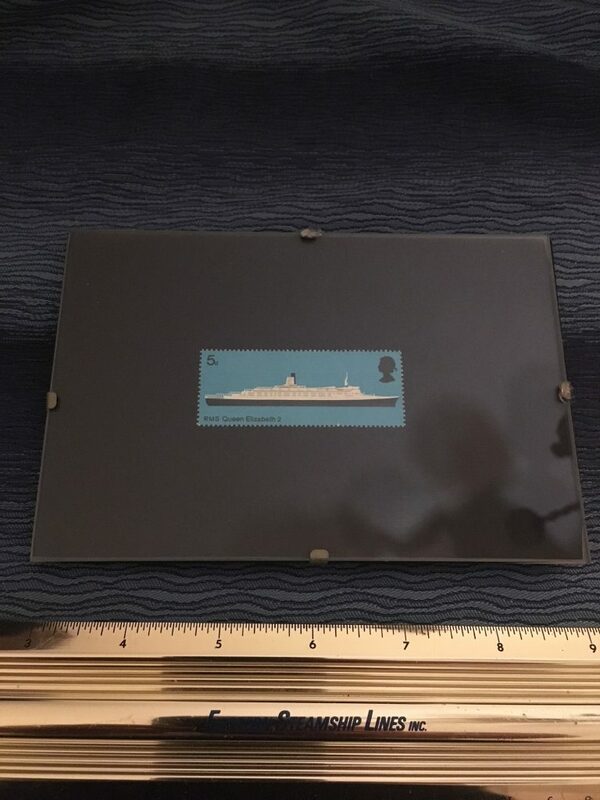 Nicely framed, this is a really nice maiden voyage stamp for the lovely QE2! 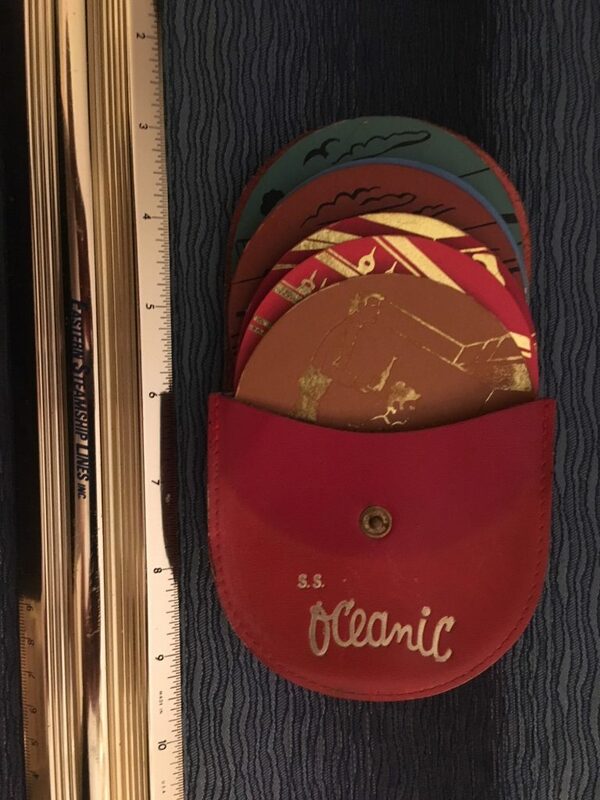 One of my favorite souvenirs for the Oceanic … a set of leather coasters and pouch . Each different colored coaster has a golden scenes of life onboard. 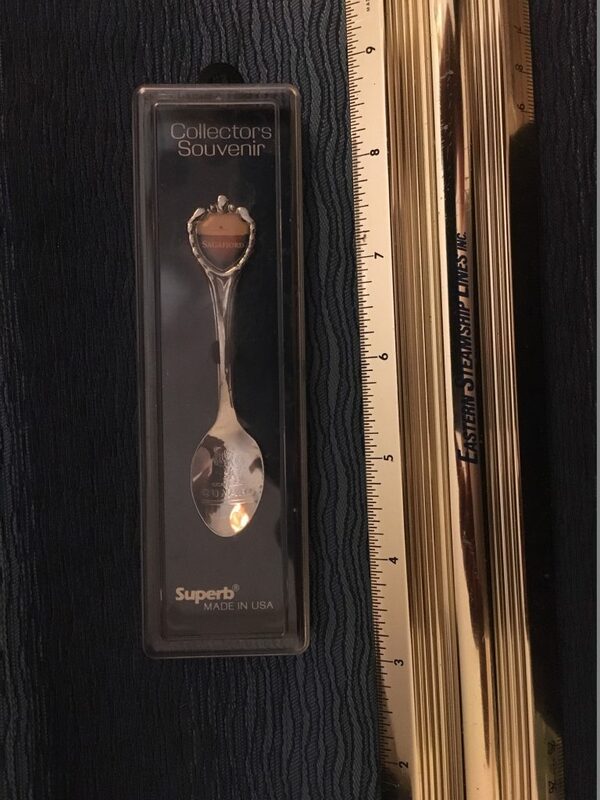 Excellent condition and a very practical gift! 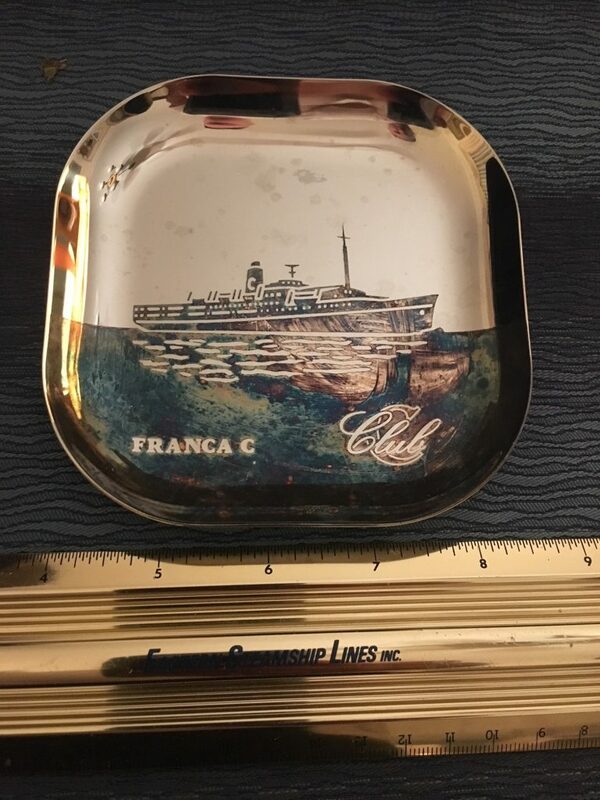 Nice heavy silver tip tray for the Franca C given to members of the “C” club. great condition just needs a little polish.